And the fabulous street-food offerings continue! New York City has welcomed yet another food truck offering delicious treats. 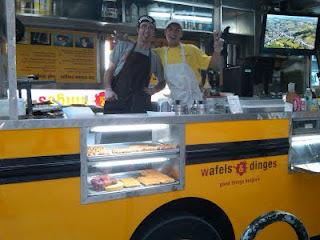 Wafels & Dinges, the brainchild of Thomas DeGeest, brings a favorite Belgian street food to New Yorkers: homemade Belgian waffles with dinges (Belgian for “stuff”, or, in this case, toppings). Just look for the bright yellow truck! Sweetly, the truck sells beverages to wash down these concoctions including hot Belgian cocoa and iced coffee. To find the truck, click here or follow them on twitter, the trendiest way to find the city’s evanescent street vendors. If you call W&D, you’ll get a special word of the day which leads to an extra treat. One step ahead of the other street vendors so far, the truck lets you satisfy your waffle craving even at midnight. Fairway, Food Emporium and Garden of Eden sell the waffles pre-packaged in their frozen food sections.